Scottish Icetrip – English from Petzl-sport on Vimeo.If there is one place on earth where climbers celebrate the arrival of the next snowstorm, it has to be Scotland. Each winter, pounded by the North Atlantic winds, the Scottish Highlands are covered by a layer of snow and frost at the mercy of weather conditions. Here, winter climbing has existed for more than a century, and the smell of adventure is as authentic as the whisky borne of the local peat. Climbing is done from the ground up, without bolts, and generally onsight. An introduction to the very modern ethics of Scottish mixed climbing. It’s in those condition that Ueli Steck flashed “the secret” (X, 10), the hardest climb in Ben Nevis. To create and produce an innovative product we must first understand the needs and wants of our customers during their various sports and activities. The following link is a Lighting Market Survey created by Petzl France that will be disseminated and used as they develop future lighting products, packaging, marketing, etc.. It is important that these results cover as wide a range of customers as possible, therefore we need your help to complete this survey. In any developing sport, the high end of the equipment spectrum is constantly changing. 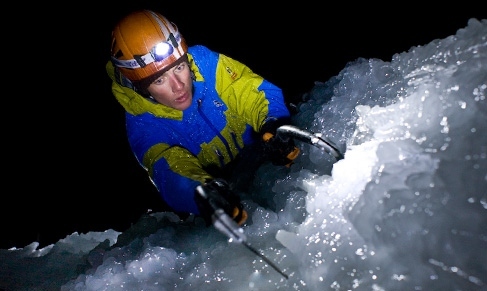 This is the case in the growing sport of ice climbing. Today’s difficult mixed routes require a delicate touch, and a thin pick is a clear advantage. It enters the ice with greater ease, causes less fracturing, and helps ensure that each swing results in a solid placement. Petzl recognizes this and offers the highest performance picks for its top-level axes, the new 2010 Quark, Nomic, Ergo. Even with their radically tapered tips all of the picks on these Petzl tools are given a “T” rating according to EN 13089, the European standard for ice tools. This is true for both the “ICE” and “DRY” picks which are both only 3 mm wide at the tip. Originally the “T” and “B” designations stood for tools that were robust enough to pass the respective tests for “Technical” and the less demanding “Basic” ice axe use. Despite this you may find B rated picks on some manufacturers technical tools. In order to receive a “T” rating, an ice axe pick must pass two tests: (1) a pick strength test – sometimes called a “bend test”, and (2) a fatigue test. In the strength test, the pick is clamped in a vise, a force is applied to it, and the amount of permanent pick deformation is measured. If this deformation exceeds the threshold, the pick receives a “B” rating; otherwise, it is rated “T”. In the fatigue test, the pick is clamped in a vise and a cyclic force is applied to both sides of the pick for a total of 50,000 load cycles, during which the pick must not break. In years past Petzl had B-rated Cascade picks, these were used on the previous generation of waterfall tools (i.e., old Quark & Nomic Cascade Picks). All of these picks passed the “T” fatigue test, and in many cases they also passed the “T” strength test as well, but not always. To insure consistent quality and ratings Petzl labeled them “B”. It is important to remember that these B-rated picks on Petzl’s older tools still passed the “T” fatigue test with flying colors. The picks on Petzl’s new Quark, Nomic, Ergo all pass “T” ratings which is quite remarkable! It is very rare to hear of someone breaking one of Petzl’s picks, they may bend in extreme circumstances but they rarely if ever break. “Charlet Steel” is indeed really incredible material. We are convinced that the excellent performance gained with a thinner pick is beneficial to all climbers and all types of ascents. It is very difficult with current technology to produce a 3 mm T-rated pick, that is why you may see some rather thick picks on some manufacturers T-rated tools, or perhaps even the use of B-rated picks on their technical tools. The picks on Petzl’s tools will allow users, novice and expert alike, to get to the top with fewer swings, better hooking, and less ice in the face. If you could change the Nomic, what would do? That’s easy; add a hammer and a spike. Well Petzl is working on this and the proto types are here. Petzl, the originator of the modern headlamp, today announced the launch of a global “Power of Light” Photo/Video contest, in line with the launch of the new series of Tikka2 and Zipka2 headlamps. Entries will be accepted beginning November 1st through December 31st, 2009, and the grand prize winner will receive their weight in Petzl gear – a package worth over $10,000. Loads of runner-up prizes are also up for grabs. “Illustrate the Power of Light” or “What Do You Do With Your Headlamp?”. • A Grand Prize will be awarded for the best video and the best photograph. Each grand prize winner will receive their weight in Petzl gear. • Rights-free music will be made available on http://video-contest.tikka2.com for entrants to download for use in videos. • Awards will be based on criteria of originality, humor, quality and aesthetics. • Winners will be announced in early 2010. Jurors and filmmakers Josh Lowell, Sean White and Guillaume Broust have created and posted videos to inspire entrants (as jurors, the aforementioned will not be qualified to compete or win). The video jury includes Guillaume Broust, Bertrand Delapierre, Josh Lowell, and Shaun White. The photo jury features Stephan Denys, Tony Lamiche and Petzl’s own Laurent de Lafouchardiere and John Evans. To tip the scales, the public will have the opportunity to vote online. For complete contest details, visit Petzl’s contest page http://video-contest.tikka2.com. The site features a cool calculator for entrants to estimate their potential winnings by calculating the equivalency of their weight in Petzl gear. https://www.neice.com/wp-content/uploads/2009/10/image_tikka-1.jpg 291 487 NEice Admin https://www.neice.com/wp-content/uploads/2017/10/2012_NEice_logo_oval_blk6-1024x350-300x103.png NEice Admin2009-10-24 10:44:502009-10-24 10:44:50"Power of Light"